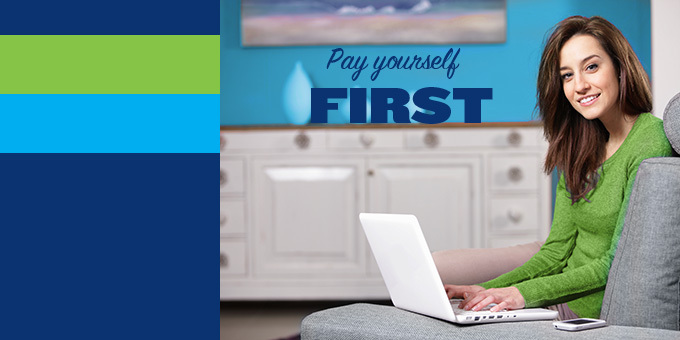 Savings accounts in Madison help you pay YOU first! Pay yourself first because you matter most. Everyone has savings accounts in Madison, right? But are they being used or just sitting empty and alone? For the longest time, I thought I had the ultimate savings plan. Each month, I had my budget in front of me with my expenses identified, ready to be paid. Once my bills were settled, whatever was left over might be used for discretionary items (shopping, eating out, unexpected expenses), but rarely did any funds make it to my savings account. While I was paying off school loans or credit card balances, this meant my savings account almost never, ever grew. In time, I had a 401(k) retirement fund which automatically deposited funds for me and I began to see the light. By making savings deductions before I spent a penny of my paychecks, I was making my savings a priority instead of an afterthought at the end of the month. Thanks to automatic transfers on paydays, I was adding to my savings before I even woke up. Slowly and surely, the fund began to grow over time. Now let’s take that same theory of paying yourself first and apply it to other goals. Perhaps a down payment for a house, a college fund, or maybe an IRA. The same theory applies by automatically having a portion of your paycheck deposited before you pay anything else. Over time, the balance of your savings account in Madison will begin to grow. It’s a beautiful thing. Whatever your savings goal is, each pay day you pay yourself first before you pay anything else like the rent or mortgage, the phone bill, or streaming subscription. There are a couple ways to accomplish this. Set up recurring automatic transfers yourself in eBanking and make updates or changes any time. The second option is to visit your HR department and set up direct deposit into your DCCU accounts. The third option is to ask DCCU staff to set it up automatic deposits for you. With any of these methods, you are paying yourself first and by making it automatic, you tend to forget about it so it becomes a solid financial habit. Similar to establishing your monthly budget, the next step is looking at your monthly income and expenses. Next, consider your fixed and variable expenses. Fixed expenses are consistent each month, such as rent or mortgage, internet/phone, loan payments, and insurance. Variable expenses can fluctuate, such as groceries, gas, dining out, or miscellaneous stuff. Where can you cut expenses? Maybe a less expensive internet and phone package, or better rate on your credit card. Looking at the variable expenses, you will probably find a few adjustments you can make. Many people are surprised how often we are eating out, and how quickly it adds up over the week. And do you really need three streaming services? You want to look at the expenses that are not a necessity and then determine how important they are compared to your savings goal. Imagine a monthly take-home income of $2,500 a month with initial expenses of $1,500. This would result in $1,000 of discretionary funds. But let’s say after some budget adjustments around your monthly expenses, your new monthly expenses are reduced to $1,250. You now have $1,250 in discretionary funds! At this point, you can decide how much of that discretionary sum you are comfortable saving each month. But how do you decide? Let’s say in addition to your 401(k) retirement savings (which is already set up for automatic deposits), you want to begin a Roth or Traditional IRA as well. At 35 years old, the standard limit is $5,500. (Or $6,500 if you 50 years old or older.) By dividing $5,500 by 12 months, you will have a goal of $458 per month. Based on $1,250 in discretionary funds, you can make this monthly automatic deposit of $458 and stay within your monthly budget. The most important thing is to make saving more active and immediate. With automatic deposits, building up your savings accounts in Madison becomes a priority. Because you matter most! Hillary is a 2008 graduate of UW-Madison. She is a proud Badger all the way, but her strong love of travelling led her to a graduate program out in Phoenix, AZ, which she absolutely adored. Now, back in Madison, Hillary is once again connected to her Wisconsin roots. In the winter, you can find her on the ski slopes whenever she has time. In summer, she's on the bike path or enjoying a good book along any stretch of lakefront. Also a passionate Mallards fan, look for her at Warner Park whenever a game is in town! View all posts by Hillary W.